The feeling was amazing. When Mr Burt said that the one and only Will.I.Am would be coming to our school, my heart started to pound with excitement. It had been a secret for at least days. And now when we all finally find out who the anonymous guest was going to be, whispers started to lurk around the big room. Brooklyn and I, as well as Raenan, Crusader and Darius were all addressed to show the special guest where his seat was placed. We all eagerly awaited outside for Will.I.Am to arrive. Also with the media crew around us. Then a big flash car pulled up to the car parks reserved for them. His body guards hoped out and walked around to secure the place. We were all so excited that we thought that each car that went pass our school was his. Then finally after a good 20 minutes later, he arrived in a flash car. Similar to his body guards. Except he had one car in the front of his , and another on the back. The cameras started to flash and flicker. The gasps, and whispers started to lurk within the hall. And the butterflies started to fly around in my stomach. He was approaching all of us now. Me being the last to shake his hand,was really nerve racking. After shaking his and his managers hands, we then made our way towards the hall, with the prefects looking like his body guards. Me and him were having a little chat while we were walking towards the hall. It was really crazy though, talking to someone as famous as him. Talking like we're buddies. It was just something that wouldn't happen to you everyday. We were making our way towards the hall, with the press being the press and flashing their camera's and videoing the moment. Before we entered into the ha;l we could already see full of amazed, and astonished looking children. We all including Will.I.Am proceeded along. We reached to where his seat was placed, and we all exchanged a smile to an fro Will.I.Am then left. Brooklyn and I were now scurrying towards the music room. We striped off our jackets and then jumped in line, still enthusiastic from shaking Will.I.Am's hand. We were all ready. And within seconds we were all standing on the stage. And within minutes our performance was over. 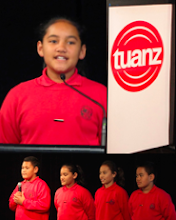 Vivienne then introduced the Hip-hop group while the kapa-haka group was entering through the back of the hall. After they finished their dance, it was Will.I.Am's turn to talk. He sure did inspire me in many ways. He told us in his speech to choose the best friends possible, to strive to make your dreams a reality, and he sure did inspire me with his background story. Then he mentions out of nowhere that he feels inspired by us so he has decided to donate our Manaiakalani Cluster a donation of $100,00.00. Everyone around the room started to applaud. But I started to cheer. The fact that he chose our school, out of the billions of schools around the world, to come and donate a huge gift towards, was just an astounding moment in life. With out the help of the Hallenstein Brothers, as well as Will.I.Am this huge koha wouldn't have been donated to us. A million thanks and grace goes toward the one and only Will.I.Am, and his sponsors! I loved your post about will.i.am it was a pretty amazing experience. You had great vocab. Reading your post just made me think back to what had happened. Keep up the great work.